Designed by Richard Masters and sculpted by Renata Gordon, the Apostle Islands quarter for Wisconsin depicts the sea caves at Devils Island with the lighthouse in the background and a kayaker paddling in the foreground. This quarter is the second of five for 2018. There are two related events supporting the official release. First there is a U.S. Mint-hosted coin forum held on the night before the ceremony, and then there is the traditional coin exchange right after the launch. Both are free and open to the public. 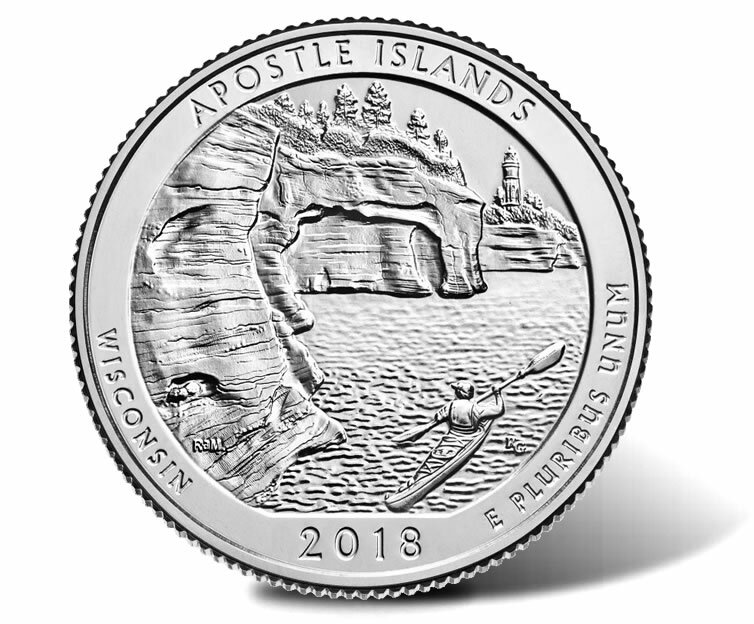 Apostle Islands quarters begin their journey into general circulation on Monday, April 9, but it can take months, sometimes years, before they appear regularly in change, since Federal Reserve Banks distribute coins to financial institutions without regard to the coin designs. The quarter ceremony provides an early opportunity to get this second of five 2018-dated quarters. The U.S. Mint offers another by selling them in rolls and bags. Richard Masters, designer of the Apostle Islands quarter, will also attend. Children age 18 and younger will receive one free new quarter to commemorate the event. The coin exchange begins immediately after the ceremony. Anyone attending the ceremony can stand in line to trade cash for $10 rolls of the new quarters. There is a one-roll ($10) minimum and a 10-roll ($100) maximum. A coin collector forum hosted by the United States Mint will take place on the evening before the ceremony. This forum gives people a chance to learn more about the U.S. Mint and to ask questions about its products. Coin forums tend to last about an hour. On Monday, April 9, starting at noon ET, the U.S. Mint will begin selling Apostle Islands quarters to the public. Product options include 40-coin rolls, 2-roll sets, 3-roll sets, and 100-coin bags at prices ranging from $18.95 to $46.95. They will be available for order online at catalog.usmint.gov. These product releases will also be covered here on CoinNews. The U.S. Mint’s series of America the Beautiful Quarters® debuted in 2010 and will last until 2021. Every year five unique designs appear and feature a national park or other national site within the United States or its territories. Michigan’s Pictured Rocks National Lakeshore quarter launched earlier this year. The three later 2018 quarters honor Voyageurs National Park in Minnesota, Cumberland Island National Seashore in Georgia, and Block Island National Wildlife Refuge in Rhode Island. 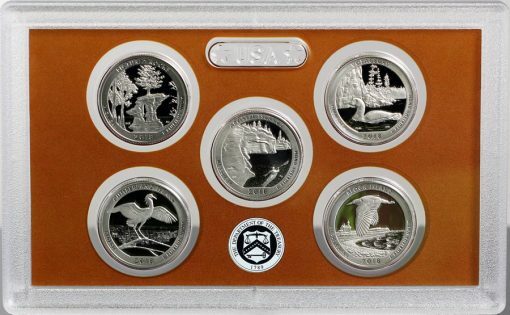 Earlier this year, on Jan. 23, the U.S. Mint released collector proof versions of all five 2018 quarters for $15.95. These coins exhibit frosted designs and mirror-like backgrounds. Proof editions in silver launched on Feb. 22 for $33.95. More recently, on March 29, the U.S. Mint issued an uncirculated set of 2018 quarters for $12.95. As always, stay tuned to CoinNews for information about these and other coin releases. You managed to both read my mind and take the words right out of my mouth. Every time I’ve looked at this coin I’ve thought how absolutely stunning the the view of this incredibly beautiful coastline would have been without the unbelievably clashing, discordant intrusion of the all too obvious and overly prominent placement of this ridiculously goofy looking depiction of a lone kayaker. The designers and those who approved the design simply and completely ruined what would have otherwise have been a spectacular-looking coin. What an incredible shame! The way this voting system works is that each up vote negates a down vote, meaning that if there is already a down vote in place, an up vote won’t appear as a “+1” but rather just bring the visible tally back to “0”. Ergo, the up votes that I just cast for each of your comments ended up as a “0” since our resident troglodyte had already swept through here with his usual instantaneous gratuitous obligatory down vote for both of you…and for me too, obviously. LOL! That is too damn funny – everyone gamble your new ATB quarters away in the casino, including the kids in attendance who get a free one from the Mint! This is akin to holding an AA (Alcoholics Anonymous) meeting at the neighborhood corner tavern on St. Patrick’s Day! Freaking awesome! Actually, most casinos use electronic cards now. No cash involved. I have only been to Vegas 14 times & only used tokens or coins, but the last time was in 2001 & they were switching some machines over to cards & paper vouchers. I like the sound of the tokens & coins hitting the metal collection bin! About 20 years ago, when I was a bank teller, and there weren’t casinos within an hour or less of virtually every major city, some people would come in and get rolls of dollars or halves to take to Atlantic City to play the slots. Now, you don’t need to drive very far, and you don’t need any cash at all. There is an original b&w episode of the tv show “The Twilight Zone” where the man gets addicted to playing one specific $1 slot machine in a casino & you can actually see him putting Peace silver dollars in it & there is a see-through glass area on the front of the slot machine where you can see multiple Peace silver dollars in it. It is a good episode for anyone with a gambling problem to watch for sure. I remember that episode, but I wasn’t paying attention to the coins. It’s amazing to remember that Peace Dollars actually circulated like that. The first time I went to Vegas around 1993, I asked a cashier about the $1 slot machines & she said they stopped using coins in them after the end of the Eisenhower dollar coins in 1978 & switched to $1 tokens then. Can you imagine the valuable (now) $1 coins that were put into all those slots back in the 50s & early 60s!? I wonder if any employees in the cashier’s office were allowed to go through the coins to see if there were any worth swapping. There had to be a few coin collectors working there. When I was a teller, we couldn’t. We could exchange them with another teller, then, as a customer, get them from the other side of the window.